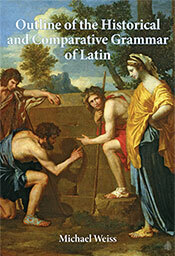 Outline of the Historical and Comparative Grammar of Latin represents an altogether novel approach to its subject. Most innovative is the format: instead of technical prose acting as an obstacle to non-specialists, each of the forty-five chapters consists of an outline providing exactly the information essential to the student and simultaneously acting as a ready reference tool. But this is no bare-bones work. Supplementing the outline are numerous penetrating notes with a wealth of additional information and important new observations and ideas. After initial chapters on Indo-European comparative philology, the history of writing in Italy, and the pronunciation of Latin, the book treats the language’s entire historical phonology and morphology in detail, followed by a full and enlightening chapter on syntax—a topic that rarely receives the coverage it deserves. Thousands of textual citations from Roman authors of all periods firmly ground the data in their philological context. The broader linguistic milieu of ancient Italy is also covered, with a whole chapter devoted to Etruscan; and rounding out the book is a rich overview of the later evolution of Latin into the Romance languages. The result is the first truly comprehensive, accessible, and up-to-date history of Latin from its prehistoric beginnings down to its medieval and modern descendants. Clear, thorough, and exhaustively researched, this Outline will be essential reading for students and specialists in Classics and Indo-European studies for many years to come. The book is accompanied by a blog which will post corrigenda and addenda on a regular basis. Since receiving his Ph.D. in Linguistics in 1993 from Cornell, Michael Weiss has held teaching posts in the Classics departments at Yale and The University of North Carolina at Chapel Hill, and is currently Professor of Linguistics at Cornell. He is the author of a number of influential articles on Classical and Indo-European linguistics and etymology, and has special interests in the linguistic and cultural histories of Greek, Latin, and the Sabellic languages. Weiss has also recently authored Language and Ritual in Sabellic Italy (Brill, 2010), a lexical and cultural investigation of the Third Iguvine Table. This item is currently out of stock. An updated edition will be available in early 2019.